Good value helmet, comfy and option for n-com installation is good. Wind noise is quite severe though. Best thing though is sportsbike's service, the perfect model for how to run an online business. Really nice fitting helmet, light, easy to use visor, brilliant chin strap but it's not the quietest of helmets at speeds above 60mph (in fact it stops me going above 60 it's that loud!) and the vent that flows air to your mouth area isn't the best, recirculating your bad bike breath mainly. I wish I had spent more with one of the top brands but it's an OK mid range helmet I have a Shoei xr1000 which is very old, it's lighter, quieter and more aerodynamic. If I had realised how bad this Nolan is I wouldn't of dropped down in brands! Instead of a Nolan, wait for a top brand helmet to sell on offer (even if you don't like the design) and I promise you will be better off. Even if it's bright pink at least your ears won't bleed. 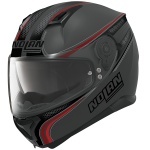 First Nolan helmet I have ever purchased, looks great, very comfortable, inner sun visor works a treat, size guide was spot on, cannot say enough about sportsbikeshop, first class service again. This is my second helmet so comparing with a good AGV K4 which I've used for 5 years. I prefer quick release but this one is more fiddly than the AGV. The fit of the helmet is great once on. Very comfortable although it will drag down your neck warmer as it goes on. The pin lock is great and the visor is easy to use. The integral sun visor is also very easy to use even with thick winter gloves. I find the helmet is much noisier the the AGV when riding a sports bike so ear plugs recommended. But if you stand up and get away from the turbulence of the fairing the noise reduces so I would expect this helmet better suited to a naked bike. 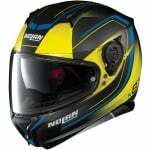 Overall I believe this helmet is well made and good value for money. The helmet looks great and feel great, very comfortable. BUT..... EXTREMELY loud when above 50mph and I can end up with ear ache so i have bought ear plugs to counter. If you do reasonable speeds don't get this!! Overall this is a great helmet, good value for money (got mine in the sale £50off). Leight weight comfy, I love the ratchet style chin strap, the air vents work well, the fitted son visor is a great feature. Only 2 minors for not giving 5 stars, sun visor can be a little awkward to operate when riding, also get some wind noise I thought it would be quieter after reading other reviews. Comfortable, fits to perfection. Protects from the wind very well. This helmet is very comfortable and fits well. It is very quiet and simple to secure on my head. The sun visor is really useful. 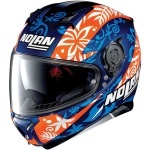 A very good helmet in this range of price (probably the best considering the market offer). Confortable, fits ok. Materials and functions are of high level. Excelent service of Sportbikeshop. I am a daily commuter on a small bike. I measured my head with a piece of string and using the sizing guide ordered a L. Nice lightweight snug comfortable fit. Flip up visor works well. I think it is good value for the price. Meets EU quality standards. I bought this after trying the IS-17 (came up too small) and the Shark S900 (came up too big) in medium. The matt finish is really nice, as is the colour scheme. The helmet is snug and fit me much better than the other two. The chin strap works really well too. I can't really comment on the noise, it is less than the training school helmet but i have no other reference frame. I've just a few dual carriageways and there is noise but i still won't bother with ear plugs. The vents seem to work well but its 0 degrees at the moment so they were shut most of the time. I used the built in sunglasses, as someone who never wear sunglasses I was pleasantly surprised. Think of them more a filter than traditional sunglasses, they worked well without impeding vision. Great quality helmet that looks good also. Lots of features to take in to account such as the option to add blue tooth seamlessly. Double pins holding the chin strap was impressive too, most helmets in the price range have a single pin. Lots of features that are a great addition, whats not to like. Comfortable and very well made, plus already has pinlock (which works very well) included. A little noisy at higher speeds but overall a great kid for a good price. This is my first helmet but I'm very happy with it. Fits perfectly and has good ventilation. Great helmet on the budget. After 5 years of riding in all seasons It was time for change. I was after good quality but not bank breaking lid with colour scheme matching my bike. 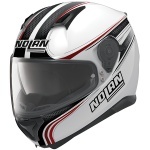 Nolan N87 despite topping list of budget helmets on Ride's list does not feel budget at all. Interior is firm and neutral in touch, pin-lock lining works it's magic at this time of the year, vents are easy to operate and efective with air channels around your head for cooling effect. Only negative is sun visor which was stubborn to move at first, a bit of WD40 and problem solved. Plenty of space around ears might seem excessive and noisy but it is prepared for N-com Nolan's own comms system (next on shopping list). All in all it's a great package for a fraction of a price of premium brands. Really comfy to wear, light, great field of view, fits really well (m for me), and not too loud. And lots of gadgets to buy and fit after if you fancy!